Je Tsongkhapa, whose ordained name was Losang Dragpa, was a great 14th century Tibetan Buddhist Master who promoted and developed the Kadampa Buddhism that Atisha had introduced three centuries earlier. His appearance in Tibet had been predicted by Buddha himself. Je Tsongkhapa patiently taught the Tibetans everything they needed for their spiritual development, from the initial step of entering into a spiritual practice through to the ultimate attainment of Buddhahood. This was a golden age in Tibet, and thousands of Tibetans were inspired by Je Tsongkhapa’s immaculate example of pure moral discipline, compassionate way of life, and profound, liberating wisdom. His followers became known as the ‘New Kadampas’, and to this day Kadampa Buddhists worldwide study his teachings and strive to emulate his pure example. This verse reveals the special qualities of Je Tsongkhapa. The third line explains that although he was an enlightened being, a manifestation of the Wisdom Buddha Manjushri, Je Tsongkhapa did not reveal himself to be a special being but always appeared in the aspect of an ordinary practitioner. In particular he never made a public display of his miracle powers or clairvoyance, and he encouraged his disciples to follow his example by not revealing any special powers they might have attained. Instead of revealing miracle powers, Je Tsongkhapa mainly worked to establish pure Buddhadharma throughout Tibet. By giving teachings and showing a good example, he led many beings to gain pure, authentic realizations of Sutra and Tantra. This is the meaning of the fourth line of the verse. The phrase ‘Joyful Land’ in the fifth line is the name of Buddha Maitreya’s Pure Land, known as ‘Tushita’ in Sanskrit or ‘Ganden’ in Tibetan, which is where Je Tsongkhapa went after he passed away. During his life Je Tsongkhapa established a great monastery in Tibet called ‘Ganden Monastery’, and he spread throughout Tibet a pure doctrine that became known as the ‘Ganden doctrine’. This doctrine is a special, pure Buddhadharma that comes from Manjushri’s wisdom. It is called ‘the great Protector’ because it protects all living beings from the ocean of samsaric suffering. All of this indicates that Je Tsongkhapa is a manifestation of Buddha Maitreya, who is the Protector of the hundreds of Deities of the Joyful Land. These days, the tradition of Je Tsongkhapa is known as the ‘Gelug’, or ‘Virtuous Tradition’, and his followers are known as ‘Gelugpas’; but the original name of ‘Ganden’ came from Buddha Shakyamuni. This is the meaning of the fifth line. As Buddha had predicted, Je Tsongkhapa appeared in Tibet, the Land of the Snows, where he lived from 1357 to 1419. When he was born, a drop of his mother’s blood fell to the ground, and later a white sandal tree with a hundred thousand leaves grew at that spot. On each of the leaves, there appeared an image of Buddha Sengei Ngaro, who is the same mental continuum as Buddha Manjushri. This indicates that the child was a manifestation of Manjushri. Later, the third Dalai Lama, Sönam Gyatso, said that this precious tree was an object of offerings and respect, and he moved it to a nearby monastery where he placed it inside a silver stupa with many precious jewels and made extensive offerings to it. This monastery became known as ‘Kumbum Monastery’, or ‘The Monastery of a Hundred Thousand Images’. Eventually other similar trees grew around the stupa and their leaves also bore special images. On some there appeared the letters of Manjushri’s mantra, AH RA PA TSA NA DHI, and on others the seed-letter of Manjushri, the letter DHI. These leaves were regarded as very precious, and when they fell in the autumn people would gather them and grind them into powder. Through tasting this powder many people have been able to cure diseases and increase their wisdom. Je Tsongkhapa showed a perfect example of how to build the foundation for the spiritual path, how to progress on that path, and how to complete it. First he studied the entire Dharma of Sutra and Tantra by relying sincerely upon his Spiritual Guides, and then he put all this knowledge into practice and demonstrated the attainment of all the realizations from relying upon the Spiritual Guide up to the Union of No More Learning, or Buddhahood. 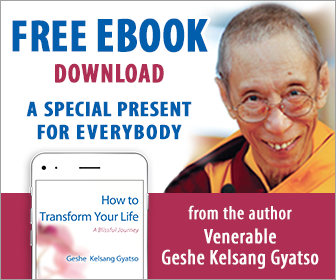 Since then, thousands of practitioners have attained the ultimate happiness of Buddhahood within one life by following Je Tsongkhapa’s example and sincerely practicing his teachings. Even today, faithful practitioners who follow Je Tsongkhapa’s pure Dharma can accomplish these results. If, instead of giving teachings and setting a pure example, Je Tsongkhapa had mainly demonstrated his own good qualities by displaying miracle powers and other forms of clairvoyance, we would have received no benefit from his actions. What we need is not displays of miracle powers but a clear example of how to enter an unmistaken spiritual path, how to practice that path comfortably and smoothly, and how to complete it successfully. This is the actual method for solving our daily problems. Since Je Tsongkhapa provided us with just such an example, we should recognize his immense kindness and develop unchanging faith and respect for him. For the fortunate people of Tibet, the Land of the Snows, your kindness, O Protector, is inconceivable. Is due solely to your kindness, O Venerable Father and Sons. Without ever giving up this endeavor. With the first, we practice the Guru yoga of Je Tsongkhapa according to the Segyu lineage. We meditate on our root Guru in the aspect of Je Tsongkhapa – the embodiment of Avalokiteshvara, Manjushri, and Vajrapani, offer the seven limbs and the mandala offering, make requests with the Migtsema prayer, and then engage in the stages of the practice of profound meditations. Through practicing sincerely in this way, we can pacify all our negative karma and obstacles and increase our merit, life span, and Dharma realizations. In particular, because Je Tsongkhapa is at once an emanation of Avalokiteshvara (the embodiment of all Buddhas’ compassion), Manjushri (the embodiment of all Buddhas’ wisdom), and Vajrapani (the embodiment of all Buddhas’ power), we can easily increase our realizations of compassion, wisdom, and spiritual power. Of these, it is especially important to increase our wisdom because wisdom is the antidote to ignorance, the root of all our suffering. As Buddha says in the Perfection of Wisdom Sutra, those who lack wisdom are like blind people who continually experience problems and suffering because they cannot see. The best method for increasing our wisdom, and thereby protecting ourself from suffering, is to practice the Guru yoga of Je Tsongkhapa, because Je Tsongkhapa is a manifestation of the wisdom of all the Buddhas. On the basis of pacifying our negativity and obstacles and increasing our life span, merit, compassion, wisdom, and spiritual power, if we rely upon this practice we will easily gain all the realizations of Sutra and Tantra and eventually attain the Union of No More Learning, or Buddhahood. Because followers of Je Tsongkhapa have a special connection with him, all these beneficial results of entering into Je Tsongkhapa’s doctrine can be achieved with great ease by practicing this Guru yoga. The unmistaken Dharma is Lamrim, Lojong, and Mahamudra. Here, ‘Mahamudra’ refers to Vajrayana Mahamudra, which contains the practices of both generation stage and completion stage of Secret Mantra. The instruction on these three Dharmas – Lamrim (the stages of the path), Lojong (training the mind), and Mahamudra – is the heart of Je Tsongkhapa’s doctrine and the very essence of Buddhadharma. To gain the realizations of these three Dharmas, we must receive into our mind the powerful blessings of Je Tsongkhapa by sincerely engaging in the practice of Heart Jewel. To learn more about Je Tsongkhapa see the books Heart Jewel, and Great Treasury of Merit. 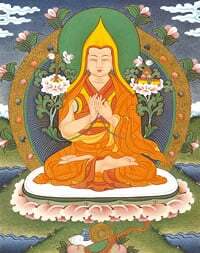 Read a condensed Lamrim teaching by Je Tsongkhapa.